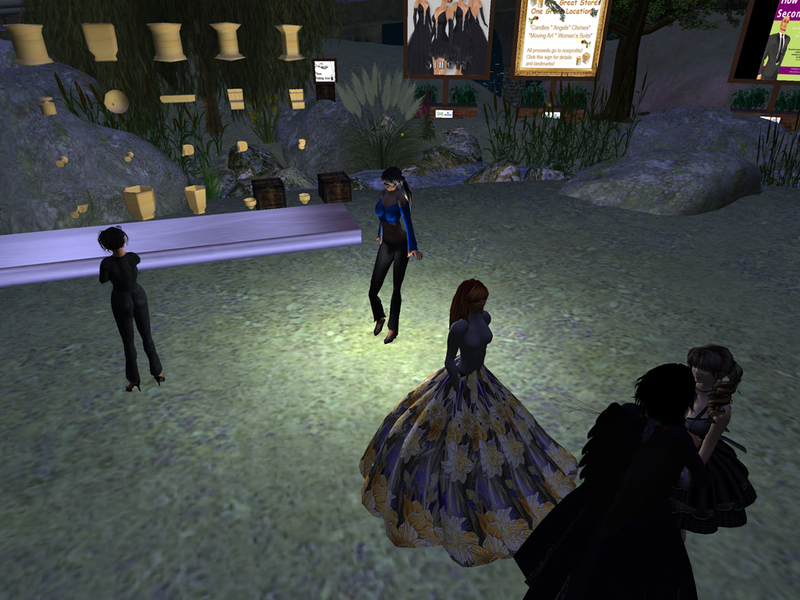 Second Life offers a lot of wonderful opportunities, limited only by our imagination… and the the technical issues. As we know, all textures must be sent from the server to our client, so dear retailers, freebie donors and people who put posters up: I know you want to save on prims, space and make the best use of all visual real estate. It makes perfect sense. I do too! When you make a vendor, or board with alternating textures, you might want to consider making it slow enough so that the image can fully rez. You have a lot of really cool stuff that I’m sure a lot of us want to see, but if your whole display goes from unrezzed to grey, to unrezzed to grey, I’m sorry, I’m not waiting around for it. In an overly commercialized word that has been carried into a commercial meta-world, we consumers and tourists are just as annoyingly demanding. If our attention isn’t caught in the first few seconds, we aren’t staying around long enough to see your wonderful display. We miss out on the opportunity to see what you have to offer, and you miss out on the opportunity to show it to us. Other that slowing the rate of texture changes, I can’t offer you a better solution. Wish I could, so sorry, but please keep it in mind. The worse that can happen if you come up with simper or innovative new solutions is that people get the full value of what you are showing them if you do. I understand that we are all new at some point, and that you want to offer someone a self-esteem boost for the day, and so it’s natural that when you see a button that says “Offer friendship” it’s an instinctive thing. I totally understand. The Truth about Second Life Friendship list: It is, generally speaking, a dark evil whose name is a lie. A better name for the “friendship” list is “Trackable, Traceable, Pounceable Contact List”. I think of it more as “The Stalker Intelligence Gathering Function”. It makes it so that you can see each time someone logs on or off, or can find them on the map and just kind of show up–whether you have asked or not. Put another way: The friendship list is a Buddy List. Same as MSN, Yahoo or other such chat programs. Now, we’ve known each other for less than 1 hour and you want to be on my buddy list why?